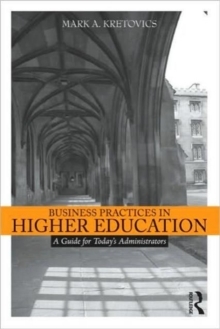 Business Practices in Higher Education is a breakthrough guide offering higher education and student affairs professionals an understanding of the fundamental business nature of colleges and universities. The author discusses the practical applications of business concepts and models and how these applications can contribute to the overall efficiency and effectiveness of higher education institutions. Useful examples from a wide range of institutions-including small privates, large publics, and community colleges-illustrate these concepts. This professional guide is organized into the following four sections: Environment and StructureFinance and FundingPeople and ProcessesPerspectives on the FutureBusiness practices pervade the academic, student affairs, and administrative sides of higher education. This book affords readers a greater understanding of the true nature of higher education and an appreciation for how the academy effectively incorporates business practices into everyday work lives.